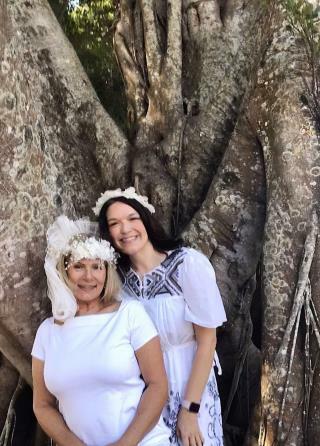 (Newser) – A Florida woman who's hoping to save a 100-year-old tree from being cut down held a wedding ceremony in which she pledged to honor and protect the imposing ficus. Karen Cooper wants to save the landmark Ft. Myers tree, whose 8,000-foot canopy graces a park near her home. Local authorities have approved a developer's request to have it removed out of fear it could topple and damage private property that adjoins the city-owned land. Cooper held the event in a bid to get people to show their support for preserving the tree. Per ABC News, Cooper's March 24 ceremony was complete with a wedding dress, walk down the aisle, maid of honor, and even a canine ring bearer. The "newlywed," who's lived in Ft. Myers nearly 40 years, says she wants to save the tree after so many others were destroyed in September's Hurricane Irma. Cooper told the News-Press the event was inspired by women in Mexico who she says marry trees to protest deforestation. "People get married at this park," Cooper quipped. "But I married the tree." A reported 80 or so people showed up for the ceremony, which included food and music and was capped off with a tree decorating ceremony. Meanwhile, the tree's life remains in the balance. A meeting to determine the ficus's fate is scheduled for Tuesday. When you come out and say you're "not a wack job" it means you are. If she tries to consummate her marriage to the tree, she's going to find a lot of nuts in her knothole.